iSophie: An expensive game of Putt Putt. An expensive game of Putt Putt. On Sunday we braved the wild Hobart winds and took the boys to Putt Putt. We figured we had all bases covered as this particular centre has an outside and an indoor course, for all types of weather. And this is Tasmania, so we get all sorts of weather, and sometimes all within a 5 minute window. Luckily for us there was no rain, just gale force winds. Yes, that makes us lucky, really! 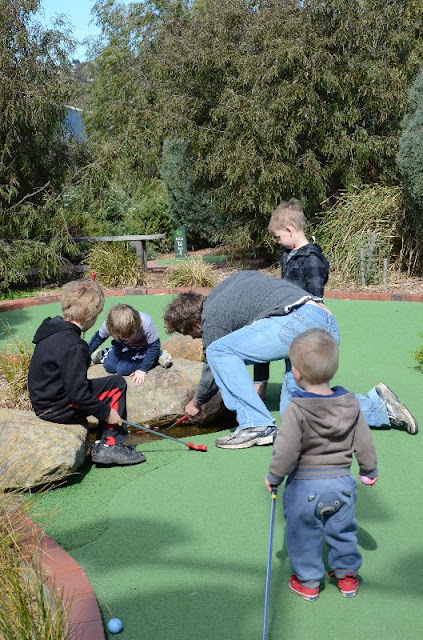 The last time I was at this Putt Putt was when my eldest sister and her family visited in April last year. That was their first (and probably only, thanks to the rain!) visit to Hobart, and it literally rained the whole time. The only time it stopped was so it could trick you into thinking it was clearing up, getting your hopes up, all the better to dash them completely with the next lashing of freezing vertical rain. They soldiered on playing tourist and seeing the sights, including a visit to Port Arthur in torrential rain, coming home completely sodden to the core. If I remember correctly, the only time they saw the sun was the day they flew out, quickly driving up to a lookout on the way to the airport so they could say they at least saw Mt Wellington. So this time around it was something different to attempt the outside course. So strong winds, 4 boys, 8 years and under, armed with golf clubs, Coder trying to keep up with a very excited Pichu, and me trying to carry my camera bag and handbag whilst chasing after them all. It was just before the very first hole, when taking out my camera, that I saw something wasn't right with the lens cap. It was now that I remembered the camera bag slipping off my shoulder and hitting the floor as we had entered the building. I felt gut wrenching anguish as I took off the jammed cover to reveal shattered glass. I am pretty sure time stopped as I watched the splintered shards falling off my lens. I had no words, I just stood there like a stunned mullet. Coder, wondering what was taking me so long, noticed I was still standing at the start of the hole. I just mumbled something and held up the lens to show him. By this stage the boys had galloped ahead, I had no time to investigate it further, I slapped on my other lens and tried to not feel sorry for myself that I had just broken my best lens. I managed to trek over Mt Field without incident and now this. Pichu has been at the age where he wants to be involved in everything for awhile now, yet usually he misses out for one reason or another. Either it's too difficult for me to juggle the 4 of them if I am by myself, so he is in the pram, or he stays home for his nap with Coder or myself while the others get to do things. 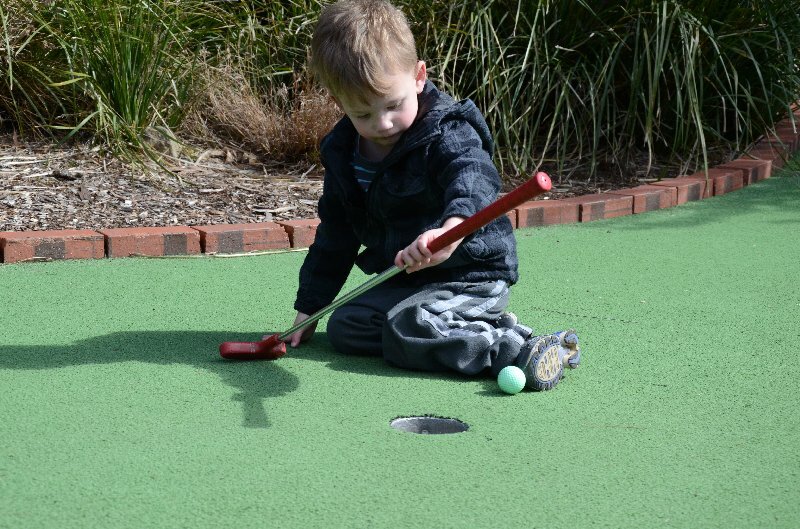 So at Putt Putt, when he saw what was happening, he was beside himself with anticipation. He grabbed that club like he was a pro golfer and took to the course with gusto. He was so excited and chatted away lively to us all whilst chasing his ball around. 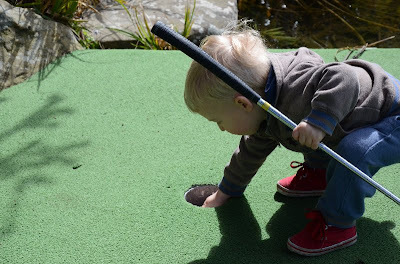 First he had to get the hang of the club, before throwing that pesky ball into the mix. Pichu cutting corners. Yes you could be fooled into thinking he was just removing his ball after his breathtaking hole-in-one. Yes, actually, let's! 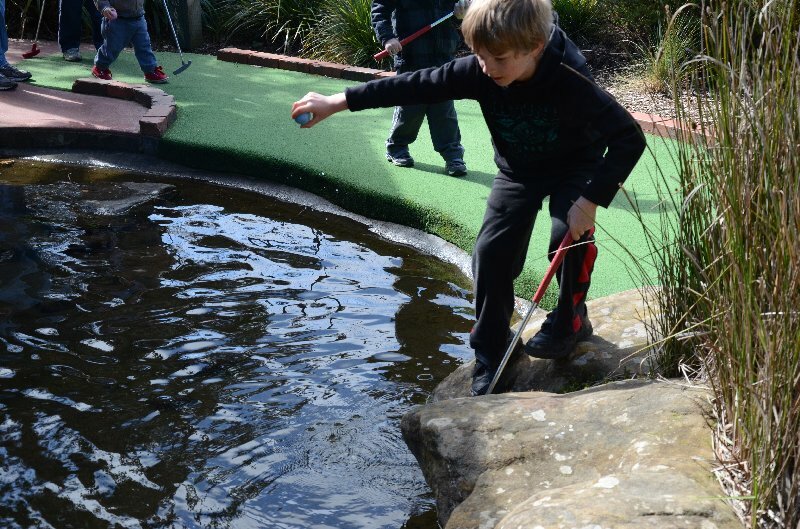 Poor Legoman, he was trying to play a serious game of Putt Putt (even managed a hole-in-one!). Voltorb frittered around, never staying still, never pausing to take his shot, just pushing the ball along like he was playing hockey. Oshawott knew the ball had to get in the hole, and would pull out all stops and tactics to obtain this goal, kicking the ball, slicing the club vertically across the ground, and then merely picking it up and placing it neatly in the hole. The latter seemed to work a treat and soon became favourite. Pichu tried really really hard, at first, but then seemed intent on keeping up with the fast moving Legoman. And the best way to do that is to just carry your club and make your way to the next available set of stairs. The club became too much of a handicap early on in this new revelation and was swiftly cast aside, along with the ball, so he could maneuver up and down stairs much faster. Kept Daddy on his toes that is for sure! There were a few times when we realised Pichu was empty handed, and I had to retrace our steps, scouring the landscaped course for a missing pink ball. No confiscated $2 ball deposit for us! No Sir! I said, "Get in the hole!" Because we forgot to watch Tiger Woods' instructional DVD first, Coder decided to give us some tips. Also in this photo you will notice Pichu waiting (im)patiently for everyone to hurry up! Look, can I just go ahead and try to play a serious game of Putt Putt?! So after the fastest game of Putt Putt ever the boys went off for a play in the playground with Coder while I ordered some lunch for everyone. I had a chance to look at the lens more closely and had a search on my phone for possible outcomes. It seemed there may be hope yet, it was the filter that was smashed and it may not have damaged the actual glass of the lens. But I couldn't get the filter off, it was jammed from the impact. I spoke to my Mum, who works in insurance, and got instructions on what to do and set off to the camera shop Monday morning. Two shops later, I found someone that could cut off the filter. I spoke to them Tuesday, they told me the filter is off but the lens is slightly scratched and it may or may not affect photos. I will have to wait and see when I pick it up today. 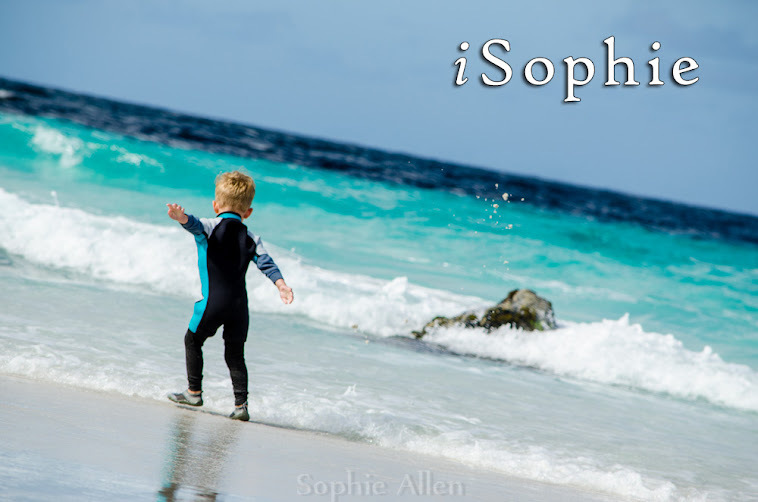 Oh Soph! I literaly gasped when I saw the picture of your lens! Hope you can get it fixed somewhat! I had a girlfriend who put her camera into her bag with a semi closed bottle of water... Well you know how that story ends... Not a pretty picture! And the worst part was that her hubby had just bought her the camera a week ago for her birthday! 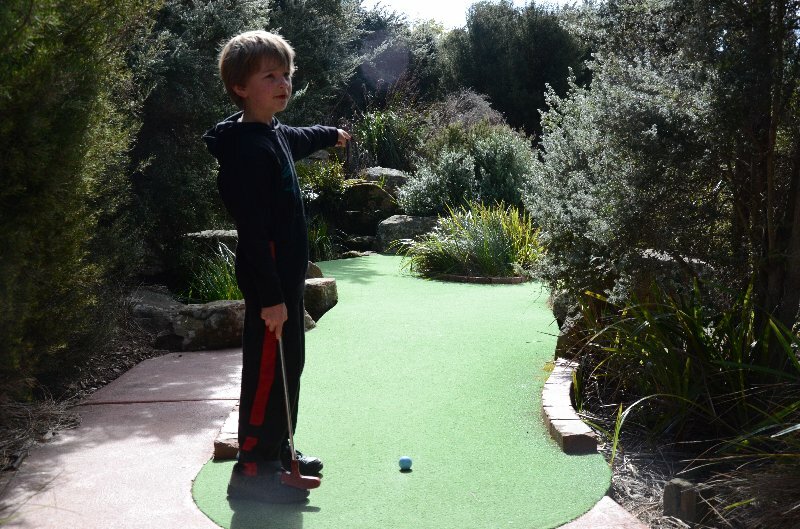 Don't you just love putt putt! Ah the ole' water bottle in bag ruining electronics. Yep yep.. lost an iPhone to that too! 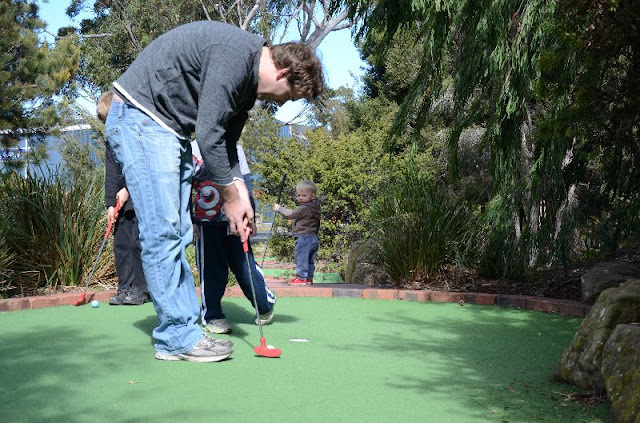 Putt Putt is great, one day I hope I will actually get to participate in the game rather then the mule, photographer and toddler catcher. Oh I know exactly how you feel! I left my camera on the dining room table with the strap hanging off the edge just the slightest bit. My 12month old daughter grabbed it and it smashed to the floor. My brand new 35mm 1.4 lens was smashed. I broke down in tears! I had a special shoot the following day and had top make the big trip into town to see if I could hire a lens. Turns out they were able to fix it, all for only $140! It's just as good as before. Thinking of you. At least you had insurance on it. I didn't before, I sure do now!! Oh my goodness... a 35mm 1.4! I would have cried too! They fixed it, for $16.50! They had to cut the filter off, and the lens itself only very minor scratches.